is the Eastern Red Cedar any good? Is this good material for bonsai? I pulled them out in some parking lot last year. It's amazing how much they grew this Spring. I know they're not Shimpaku or Chinese Juni but thought I will try to do something with them in time . 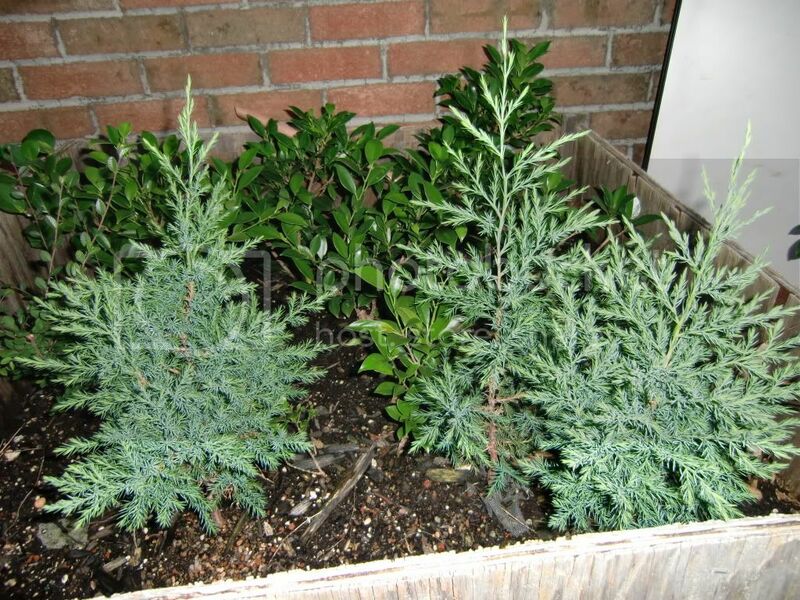 . .
Juniperus virginia - Eastern Red Cedar can make very nice bonsai - in time, but not as young whips. Do not attempt formal upright style. They are best as big old twisted stumps when you have good lower branches. The problem is that the low branches usually die off and then they don't back bud well. Let yours grow out. They respond very well to fertilizing. But bend and twist them early on. Force them into odd, but pleasing, shapes with low branches on outside curves. Hopefully the trunks will take the bends permanently and the low branches survive when the trees grow old. As Nick Lenz writes in his book BONSAI FROM THE WILD replacement branches can easily be grafted onto the trunk of the ERC using newer top growth or younger branches. OR you can even graft on branches of shimpaku after removing all cedar branches. The rugged bark on older cedar trunks can look very impressive with only branches of shimpaku juniper. All that is years down the road for you. Meanwhile keep your young ERC growing strong. Learn the techniques for branch selection, development, pruning and pinching. Have fun! You about gave the most positive advice so far. Over at the nut house they say this material is only good for newbies to practice on. I really like the grafting project you mentioned. This brings alot of hope. If you can get the book I mentioned you will have a rich resource of valuable info. Mr. Lenz provides just about the best, and sometimes quirkiest, reading by an American bonsai professional. He resides in Western Massachusetts and works primarily with native trees collected in his part of the world. Don't know where "the nut house" is, but they've obviously got their shades, blinds, and shutters drawn. There are tons of credible J. virginiana bonsai, and quite a few that I would consider masterpieces. Have a go at a google image search and you should bring up quite a few. Of course, as in any hobby, there are very vocal hardliners who will insist that something can only be done this way and that, if it's not, you're a neophyte ignoramous whose sole purpose it is to troll his territory (didn't you smell the urine?) with flame bait. These are usually the same people, in bonsai, who will insist that "there's no such thing aas an indoor tree" and that "if [pick a deity] wanted them there, they'd have walls around them". Of course, they completely miss the concept about the tree being in a pot. <shrug> Just move on. Do your own research. Ignore with weasels with penchants for lifting their legs on every post 1mm to the left of conservative. The "nut house" refers to another forum and I 'm not going to knock it or anyone else's approach to all things bonsai. And I'm not a well educated historian or bonsai expert - but I have this opinion about comparing trees in pots versus growing trees indoors. In the earliest discoveries of documented examples of bonsai the apparent desire was to bring nature indoors. This was accomplished by placing various plant material onto slabs of stone. It was found that root pruning (a generalization) and frequent top reduction as well, would keep the trees from growing very large. Planting these materials into ceramic pots would come later on. But the key here is that containing the roots could be easily accomplished without seriously harming the trees. Now on to the 'indoors' thing. In those earliest times indoors meant something totally different than it does today. We are talking hundreds of years ago - way before glass windows, central air conditioning (HVAC), Home Depot, etc. Before there was a United States of America. Homes in those Asian lands were much more open to nature around them. Bringing trees indoors meant into an open courtyard or to a room with no solid walls, only slats for ventilation. The concept of growing indoor 'houseplants' came much later. European merchants and travelers visiting exotic tropical destinations discovered the unusual and beautiful flora and brought examples of them home to enjoy and to sell. But the new owners of these plants needed a way to protect these tender beauties from the harsher climates of their homelands. In order to replicate tropical environs they invented glass enclosed conservatories - later on greenhouses. They then loaded these with their tropical plants and trees. In time this evolved into the houseplant industry we have today. However the earliest bonsai practitioners had the sense to provide as close to a natural environment for their 'potted trees' as possible (weather wise) while still confining the roots. They knew that in nature confined roots happened in the mountains where they gathered these trees - rocky ledges, crevasses and so on. That was natural. What is not natural is bringing these same trees into a 21st century home unless you can provide all the required lighting, humidity, temp fluctuations (especially nighttime), moisture, air-flow, dormancy needs, etc. Not to say that this can not be done - I've seen fabulous examples of hardy trees grown indoors, but it is NOT the same thing as root confinement which is what growing trees in pots amounts to. Apples and oranges I guess. you make me think of 四合院, google it up. Unfortunately, a bonsai in a pot that is never root pruned... well.. nothing natural about being in a pot, and nothing natural about being indoors. There are PLENTY of species, as well, that will do just fine, indoors, year round, without fluctuations in temperature, or wind, etc. This is the problem with the "trees MUST be outside argument because it's natural" argument. The "must" part is not an absolute, and the natural part is a complete fallacy. Be that as it may, some trees WILL live indoors and some trees WILL die indoors. Simple as that. Non-issue here because J. virginiana is one of those that WILL die indoors. BUT, although it's not a traditional bonsai subject (if we only worked with those subjects, we'd have nothing but Asian trees), it does work quite well. I apologize for going so far off the original topic here. Please see my new thread over in the INDOOR BONSAI area. bonsai people in Asia also like growing imported trees in addition to native species. There's no reason to not try but there are species better suited for bonsai and some not to varying degrees. Some of it is personal preference. I'm no professional, it's just a hobby or pass time. Re: is the Eastern Red Cedar any good? I just read this so interesting topic about the Eastern Red Cedar Bonsai. I have one that I bought recently and which is pretty young (3 years). Sadly it got yellow a month ago and I don't know why. Is it dead? I followed the instructions that the seller gave me and put it outside on the balcony from the day I switch on the heating in my appartement. Do you have any idea why it's getting yellow? Should I put it back inside? I just wanted to comment that I appreciate the discussion of the worthiness if Eastern Red Cedar as Bonsai material. They're coming up in my garden and I've dug up a couple to work with. They're about a foot tall and I potted one and moved the other out from under a Black Walnut. While heading to a nearby state park, I saw places along the road (Rte 71 for anyone interested) where a lot of these were coming up a few feet off the pavement. I'm pretty sure I could collect a couple w/out ruffling any feathers. I wonder what would be the ideal size to collect. Too big and I won't get a decent root ball. Too small and it won't be worth the drive. Trying to germinate Eastern Redbud tree seeds....Any ideas?